Cultural cross-pollination is a good thing, but when it comes to those running Korean restaurants, well, let's hope they stay clear of other restaurants. I don't know if you've noticed, but in the heart of Honolulu it's hard to find a Korean restaurant that's big on panchan, or ban chahn, those complimentary side dishes indicative of hospitality and restaurant quality. One restaurant, Mary Jane's Kitchen, that is no more, was known for offering 18 of the little plates per sitting. These days, you might see restaurants offering four to six of the little appetizers, which is still plenty by Western restaurant standards, where nothing comes "free" but bread and water, and even then, sometimes you've got to ask for both. Then there's the work-ethic thing. More little bites mean more dishes to wash. There's got to be a correlation between Westernization and shrinking panchan. Han Yang is one bright spot in Kalihi, where there are a lot of tables to fill, meaning staffers may have to try harder to draw a crowd. By day, the lures are $6.95 combinations of kalbi with your choice of barbecue chicken, beef or meat jun. In the evening, diners are welcomed with about 10 panchan -- varying from pickled onions to spicy fishcake to the yam cake konnyaku, served in a dipping sauce of shoyu, sesame oil and green onion -- each meant to wake up your taste buds for the ensuing meal. Young Aber-Song, of Han Yang, brings servings of Kal Bi and Bi Bim Bab to the table. Seating is in booths at wide tables. You may have to speak louder than normal to be heard by your dining partner in Siberia, about a yard away. You'll appreciate that great divide, though, when you realize the space is necessary to accommodate a grill and all those little plates. Just think of those chopsticks as finger extenders as you're reaching out for a bite of soybean sprouts. The grill is for yakiniku offerings of kalbi, brisket, tripe or pork back, with a minimum of two orders at $18.95 per. It's a splurge, and considering there are so many other a la carte specialties, seems rather limiting. 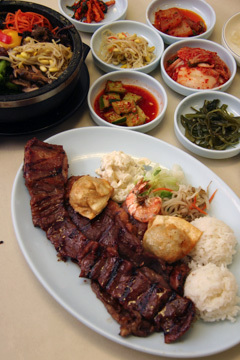 It's no surprise that servers say the most popular order is the Han Yang Special, a plate featuring a thick cut of kalbi, barbecue chicken, bulgogi (teriyaki beef to you), a couple pieces of fresh-made deep-fried mandoo and a single butterflied shrimp, in addition to the basics of cabbage, bean sprouts, rice and soup. It's enough to share, but it's always a courtesy to the restaurateur to order a second dish so you're not just taking up space. Inexpensive plates, noodle and soup dishes abound, at $6.95 for mandoo and noodles in soup, or for a BBQ beef and chicken combo. You'll also find a lot of fish on the menu, both steamed and grilled. An order of dried yellow corvina ($13.95) gets you two of the whole fish, which are to Koreans what moi is to us. If you're not shy around chili peppers, you might try a specialty of fiery kim chee stew ($9.95). It's easy to pick at pieces of cabbage and tofu in the stew, but these are meant to be eaten with the spoon that accompanies your chopsticks. For those in search of Korean comfort fare, look no further than the stone bowl bi bim bab ($11.95). Bulgogi, vegetables and shiitake are arranged in a circle on top of rice that turns crisp wherever it comes into contact with the pot. These ingredients are topped with a fried egg, and the whole mix is meant to be stirred at the table with ko chu jang (hot bean curd paste) stirred through for flavor. The end result is alternately sticky, chewy and crunchy with healthy greens and a touch of meat -- a snapshot of Korean cuisine in one bowl. Han Yang plates are served with a wide variety of tradtional Korean side dishes.